Scooper - Technology News: What does the Zika virus mean for travel? What does the Zika virus mean for travel? After the Ebola outbreak and the spread of MERS (Middle East Respiratory Syndrome), the world’s attention has turned to the most recent outbreak: the Zika Virus. While this virus has not proven to be deadly, it is spreading fast, with more than 1.5 million people already infected in Brazil. While the virus is not dangerous for most, causing mild fevers, skin rashes, aches and pains, headaches and conjunctivitis, it is extremely concerning for pregnant women as it has been linked to birth defects. The virus is causing fear and panic, as more and more countries are reporting cases of Zika, including the United States. It is of particular concern to travelers who are planning to go on holidays to countries which have reported Zika cases. So what should you do, and what does this mean for the travel and tourism industry? First of all, listen to the authorities on the subject : The World Health Organization (WHO) issued a declaration on February 1st, specifically mentioning that there should be no restrictions on travel with countries that have reported cases of the Zika virus. Travelers should however be provided with up-to-date advice on potential risks and appropriate measures. The World Travel Organization is working closely with the health and tourism authorities to make sure that residents are well informed and working directly with the industry to follow prevention recommendations. Figure out if your destination is affected: With more and more cases being reported each day, it is important to figure out if your destination is affected in the first place. At present, more than 20 countries have reported cases of the Zika virus, but for the latest information can be found on the Pan American Health Organization website . 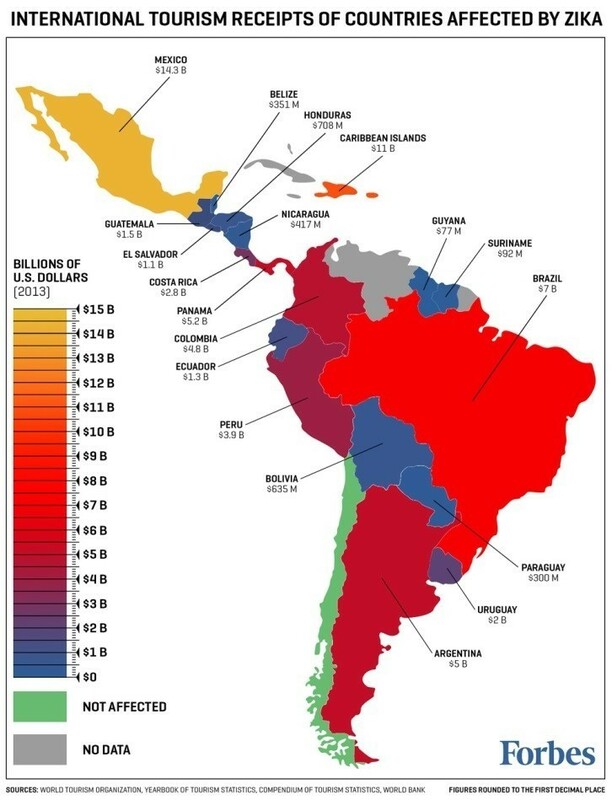 Forecasts from the WHO estimate that up to four million people are at risk of being infected in the Americas by the end of 2016. Don’t panic: At this stage only pregnant women are advised not to travel to countries which have had reported Zika cases. Given the mild symptoms for everyone else, other travelers shouldn’t panic and reconsider their travel plans at this stage. Unsurprisingly, people’s first reaction is fear. A survey from the travel risk management company, On Call International, found that 64% of Americans said they would cancel trips to areas affected by Zika. Tune in to the travel and tourism industry: International organizations, governments and the industry are working together to handle the Zika virus. Travel companies are fully aware of the situation and are developing solutions to be as flexible as possible with pregnant customers. Airlines, cruise companies and resorts have been working to put together policies to handle credit, refunds and/or trip alternatives for their customers. For many of the countries affected by the Zika virus, travel and tourism is a key industry, accounting for a significant proportion of GDP. So what are the implications for these countries and the industry? From the Caribbean, where many go on spring break or honeymoon, to the upcoming 2016 Summer Olympics in Rio, the impact of the virus - should it persist - could be disastrous for the region. According to a recent article published by Forbes, Zika virus fears could cost these countries up to $63.9 billion in lost tourism revenues. While this figure may seem large, it goes to show how important travel and tourism is to countries in the region. For instance, in 2013, expenditures made by international tourists in Mexico amounted to $14.31 billion, according to the World Bank. In the United States, travelers spend more than $214.7 billion in 2013. Given that the Centers for Disease Control and Prevention (CDC) issued its travel advisory on the 15th of January, there is little hard data at this stage to provide clear trends on travel cancellation. However, bookings trends showed a sharper decline in bookings to Caribbean destinations (ForwardKeys) as of January 25th. While it is clear that the costs of the Zika virus are likely to be high for the industry, past experience shows that destinations do bounce back.